When you can’t carry thousands of fish to a body of water by truck, you drop them from the sky. That’s the approach being used by the Utah Division of Wildlife Resources, according to video from Fox 13 Salt Lake City. 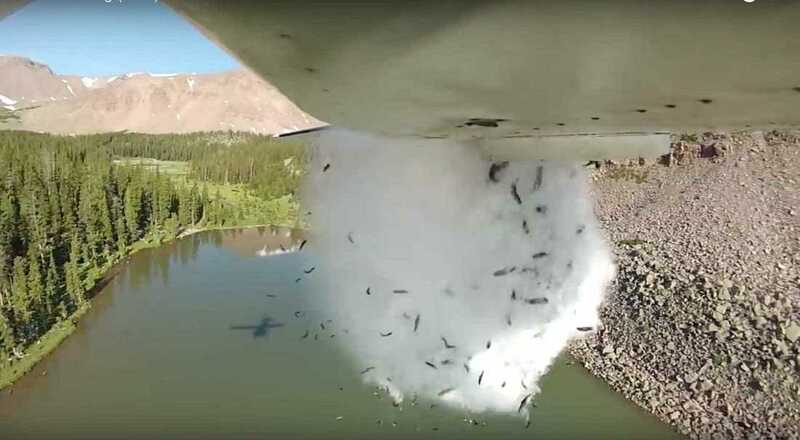 Ted Hallows, hatchery supervisor in Kamas, Utah, attached a GoPro camera to the bottom of a plane to show the stream of fish falling into a Utah lake below. The method is only used in hard-to-reach areas like the Uinta Mountains. Up to a thousand fish are dropped from a compartment in the bottom of the plane, according to Fox 13. The majority of the fish survive the drop. Utah’s native fish are raised in state-run hatcheries before being transported. In the summer, DWR stocks tiger trout, rainbow trout, brook trout, and splake. In the fall, they stock cutthroat trout and grayling. Depending on the species, fish are restocked every year or every three years, according to Fox 13.